Panel allows you to create customized layouts for multiple uses. In this example we create a msn message box by using panel and layout plugins. 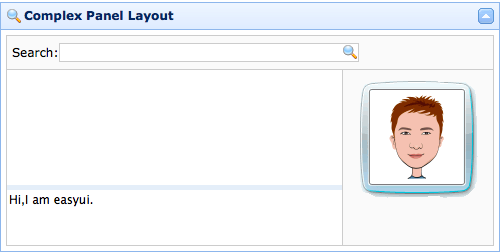 We use multiple layout in region panel. On top of message box we place a searching input, we also place a man image on the right. In center region we split it into two parts by set split attribute to true, which allows user to change the size of region panel.